The Havanese is a small family dog known to bear a variety of names. Names of popular soap opera stars are an interesting source. Lucci (Susan Lucci from ‘All My Children’), Melody ( Melody Thomas Scott from ‘The Young and the Restless’) , and Geary (Anthony Geary from ‘General Hospital’) are just a few options from the world of soaps. The Havanese is one of many breeds that falls under the classification of toy. A fun group of names can be borrowed from popular children’s toys. Pogo, Koosh, Polly, Stretch, and Weeble are a few names coming from toys that have gained fame over the years. 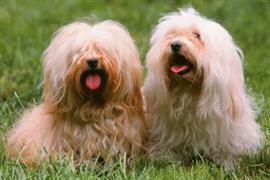 The Havanese is known as Cuba’s national dog where the ancestors of the modern breed can be traced. Some unique ideas related to the breed’s history can be taken from cities in Cuba. Some Cuban city inspired names include Havana, Trinidad, and Holguin. Some of our pages will contain a subcategory. A subcategory is a slightly more specific grouping than the main topic of the page. For a subcategory, we will include a separated table of names and corresponding descriptions. An example of a subcategory of Red Dog Names would be 'Dog Names Inspired by Red Wines'. If you have any subcategory ideas for the Havanese Names page, we would love to hear them. Use the form below to submit your ideas.